I finally returned to work full time this week. I was not sure how everyone would return and was prepared for the worst but surprisingly they all returned with smiles. I had the happiest group of kids and that made me feel pretty great. Physically, I had my moments for sure. By evening I was sore but not in what I would call PAIN and no doubt exhausted. One night I was sleeping in the recliner 45 minutes after they all left….wow was I tired. 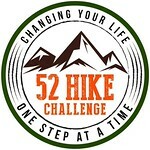 With three more hikes added to my list this week I am even closer to accomplishing the 52 hike challenge. We are still making progress on our to do list for Spring but I am hoping to add at least one more hike to the log this weekend to get me a little closer to this goal.